A large North Canterbury dairy farm, believed to be Canterbury's highest priced rural property sale in 2014, illustrates the strength of demand for dairy land, despite the sector's falling payouts. Located 10 kilometres west of Culverden and 109 kilometres north of Christchurch, the 617 hectare farm changed hands just prior to Christmas in line with recent values for local dairy land. Peter Crean of PGG Wrightson Real Estate, Christchurch sold the property, which was purchased by a syndicate of New Zealand farming interests. Recent reductions in the dairy payout pose challenges to some farmers. However, those with a longer-term outlook remain strongly motivated to invest in or consolidate farm ownership. If anything, that demand is stronger than ever, as this sale demonstrates. 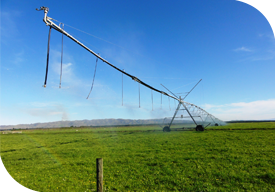 Demand is strongest for well-located and efficiently irrigated properties with high-quality farm infrastructure. This farm ticked all those boxes, which led inevitably to intense interest from prospective purchasers, he said. Producing 633,000 kilograms of milksolids last season from a 410 hectare milking platform, the property featured a 60-bail rotary milking shed built in 2006, six dwellings and 585 Amuri Irrigation Company 'A' shares. Peter Crean said recent Canterbury dairy farm sales have ranged in price from $50,000 to $56,000 per hectare, excluding dairy company shares. For the part of the property that is already farmed as a milking platform, this sale sat within that range. Meanwhile, the rest of the farm was valued in line with recent local sales of dairy support blocks, which are selling between $38,000 and $42,000 per hectare. Although presently operating as a self-contained unit, this is a farm that could be developed to further enhance production by building an additional dairy shed and turning the whole property into a milking platform, which was an attractive opportunity for the purchaser, he said. Marketed under a deadline sale process and sold as a going concern excluding dairy company shares, the property attracted multiple offers including from interests based overseas. Peter Crean said the previous owners, who started in the industry as sharemilkers 47 years ago, are now moving into semi-retirement after a successful career developing and operating dairy farms.